During the Christmas break, my family and I had the opportunity to visit Antique Archaeology in Nashville, Tennessee. 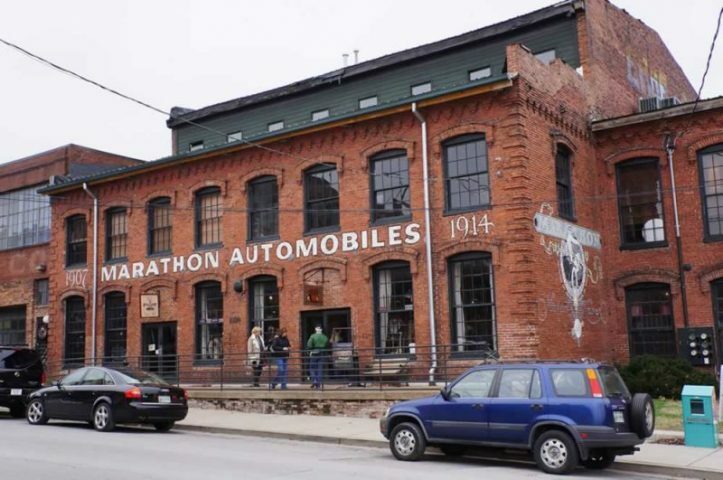 We are fans of American Pickers, so this seemed to be a logical destination. While our design aesthetic doesn’t lean towards the rusty gold featured on the show, we were hoping to find a small conversation piece that might fit in with our decor and our budget. We enjoy browsing at antique stores and flea markets and we do in fact make the occasional purchase. There certainly is a “cool” factor that would surround an item purchased at a store featured so prominently on a hit reality television show. We weren’t naive enough to think that the store would be empty, but we certainly did not expect the number of people we encountered. At least two dozen vehicles were parked in the lot across the street. That’s about the number of cars you might typically find at a large antique mall. And a large antique mall this is not. The store is a single showroom and there was no space for the crowd to spread out. Picture a gift shop in an amusement park near the end of the day and you get the idea. Small sample of the crowd inside Antique Archeology on December 27, 2012. “Gift shop” is an appropriate description. Antique Archaeology merchandise takes up roughly a quarter to a third of the store. You will find T-shirts, hats, magnets, shot glasses, license plates and similar items. No doubt twenty-five dollar t-shirts are more affordable for the average person than thousand dollar porcelain signs. The branded merchandise was definitely flying out the door on the day that we were there. I have to wonder what generates more profit for the store– the branded merchandise or the actual antiques that are allegedly the reason for the store’s existence. 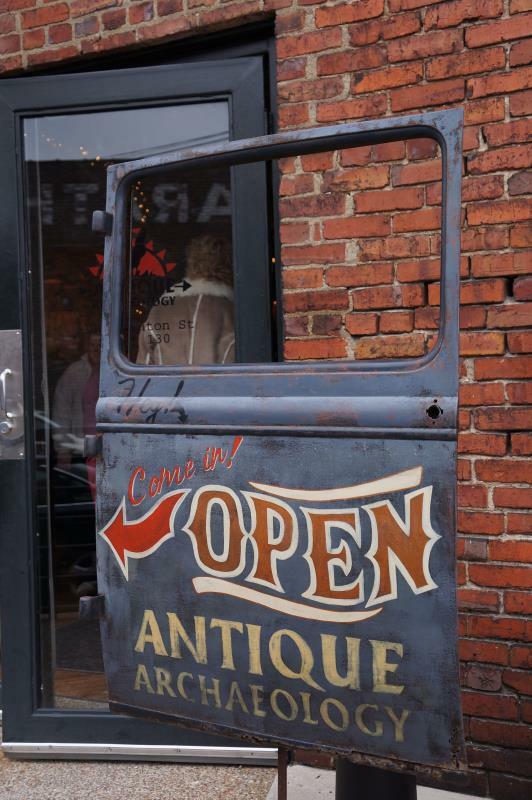 Fans of the show will recognize the vast majority of antiques in the store. In that respect, the store functions as a museum. 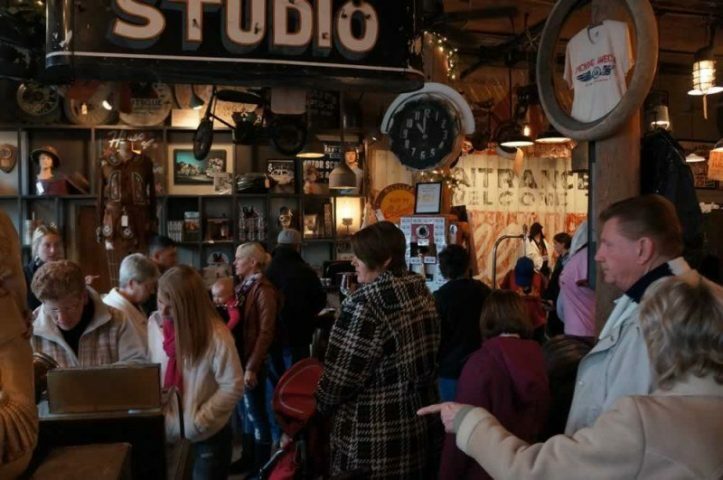 In fact, iconic items like the Indian motorcycle and the large red arrow are labelled as “Mike Wolfe’s Personal Collection.” They don’t appear to be for sale at all. I believe that this is further proof that the target customer of this store is as much the tourist looking for souvenir t-shirts as the serious collector looking for that unique piece of Americana. That’s not to say that you won’t find antiques for sale. I am that there were some. Unfortunately, with so many people in the store I probably missed 90% of the antiques. For that, I am disappointed. I would have preferred to have spent more time and taken in everything Antique Archaeology had to offer. At the end of our visit, we purchased two t-shirts (for my daughter and for myself) and a souvenir Christmas ornament. The XL shirt I bought for myself is too small. Compared to other XL shirts in my wardrobe this one is a large at best. Either the shirt was mis-marked, or else the shirts at Antique Archaeology tend to run smaller than average. Keep this in mind if you are ordering merchandise from the website. 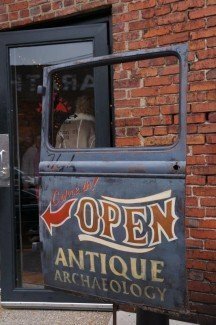 Antique Archeology Nashville– instantly recognizable to fans of the show.